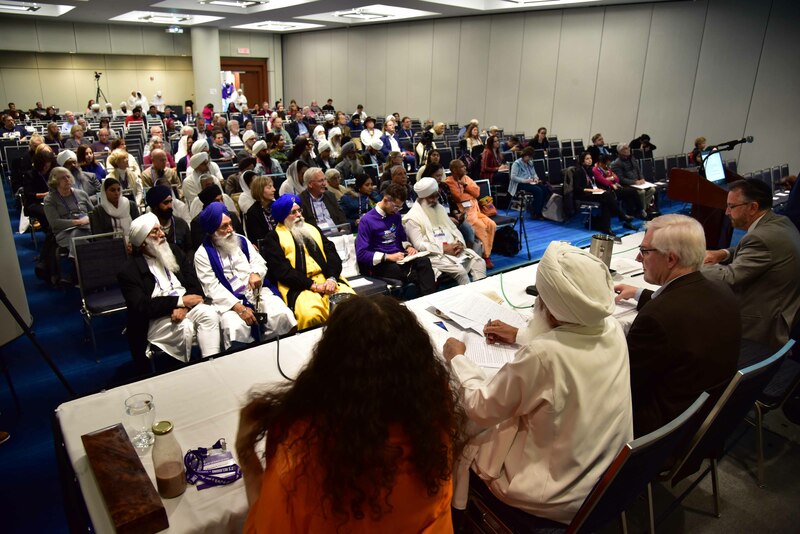 TORONTO, ON (November 1, 2018) – The Parliament of the World’s Religions (PWR) – the single largest interfaith gathering in the world – commenced its seven-day programme today in Toronto, drawing an enthusiastic audience interested in learning more about interreligious harmony. It was created to cultivate harmony among the world’s religious and spiritual communities and foster their engagement with the world and its guiding institutions to achieve a just, peaceful and sustainable world. The themes for this year’s Parliament are: The Promise of Inclusion, the Power of Love: Pursuing Global Understanding, Reconciliation and Change. A Seminar on Forgiveness and Reconciliation: Perspectives from the World’s Religions, hosted by the Charter project, took place on 2 November 2018 and was very well attended by 140 participants. They listened to the highly informative presentations of the world class speakers on the panel. 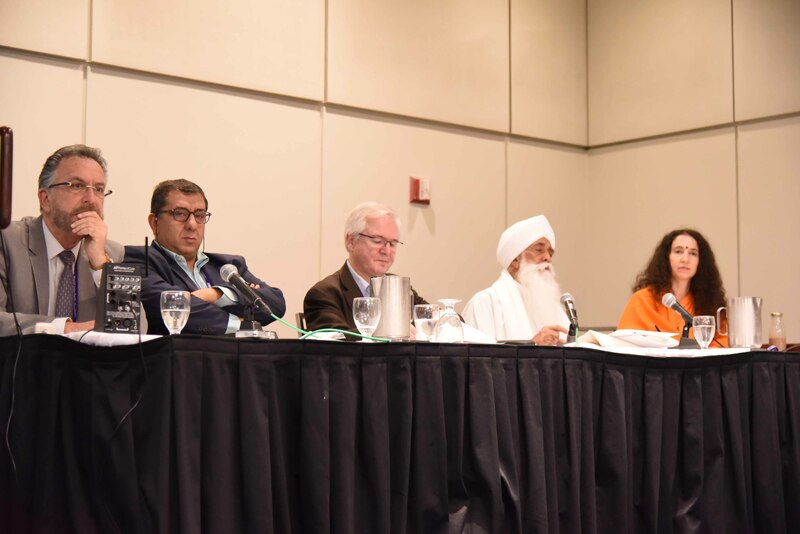 Bhai Sahib Bhai Mohinder Singh (Sikh), Rabbi David Rosen (Jewish), Prof Mohammed Abu-Nimer (Muslim) and Sadhvi Bhagawati Saraswati (Hindu) spoke with great passion about forgiveness and reconciliation in the context of their respective faith traditions. The panel was moderated by Dr Josef Boehle, the Director of the Charter for Forgiveness and Reconciliation. With over 6000 participants attending the Parliament, with dozens of high-profile guest speakers and more than 1000 spiritual programs, lectures, and interactive cultural experiences, the event offers an opportunity to advance interreligious dialogue and cooperation, responding to the critical issues of our times. 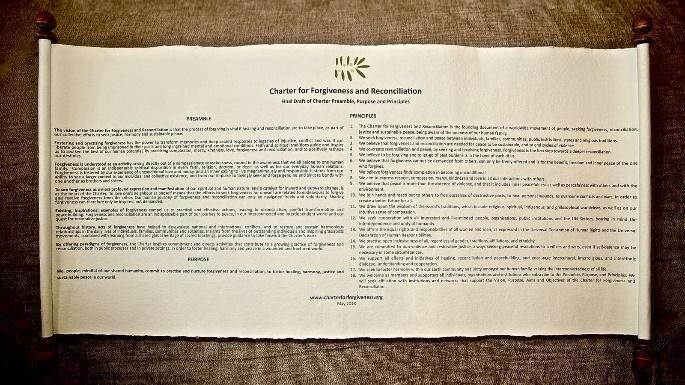 The initiators of the Charter for Forgiveness and Reconciliation sincerely hope that the Charter will be embraced and acted upon, to foster forgiveness, reconciliation and peacebuilding worldwide. 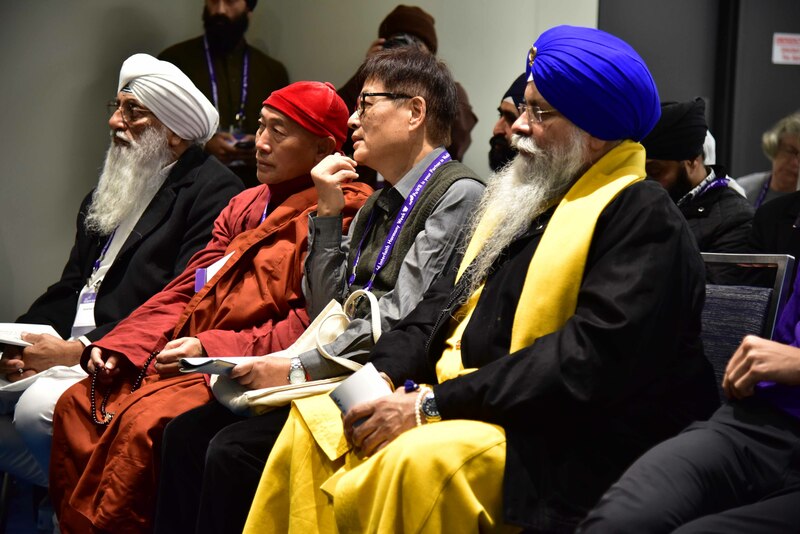 TORONTO, ON (November 1, 2018) – The Parliament of the World’s Religions – the single largest interfaith gathering in the world – kicked off its seven-day run today in Toronto, drawing an enthusiastic audience interested in learning more about interreligious harmony. Opening Ceremonies began with a spiritual ceremony from the Indigenous Nations on Turtle Island with greetings from the host First Nations, the Haudenosaunee Confederacy and the Mississaugas of the Credit, and special addresses from local and international leaders. Following this ceremony, the Honourable Elizabeth Dowdeswell, Lieutenant Governor of Ontario, The Honourable Ahmed D. Hussen, Minister of Immigration, Refugees and Citizenship, Chief Ava Hill, Chief of the 56th Elected Council of the Six Nations of the Grand River and Chief Stacey Laforme, Chief of the Mississaguas of the New Credit First Nation joined Parliament leaders to officially welcome delegates to the 2018 Parliament of the World’s Religions. Nearly 10,000 participants are expected to attend Parliament from Nov. 1-7 at the Metro Toronto Convention Centre. Featuring dozens of high-profile guest speakers and more than 1000 spiritual programs, lectures and interactive cultural experiences, the event offers programming for all, from scholars and activists to families and children. Participants can be individuals whose profession or personal interests lead them to the Parliament or delegations from the guiding institutions, such as states, universities or religious organizations. The Toronto Parliament will explore three themes: The Promise of Inclusion, the Power of Love: Pursuing Global Understanding, Reconciliation and Change. Sacred Music Night – Nov. 4, 6 – 8 p.m. – Exhibit Hall ABC, Level 300. On Sunday, Nov. 4, Parliament will host a Sacred Music Night that will inspire, uplift and create a feeling of awe through the music of the world’s religions. The night will feature musicians and performers including Jack Lenz, John Anderson, lead singer of the band Yes, Red Sky: First Nations Contemporary Dance Ensemble and Aviva Chernick. On Monday, Nov. 5, Canadian poet, novelist, literary critic, essayist, inventor, teacher and environmental activist Margaret Atwood will join Parliament for an exciting session titled Women and Climate Change: A Conversation Between Margaret Atwood & Lucy Cummings. This conversation will explore the intertwined nature of climate change, conflict, and violence against women. The event begins at 4:15 p.m. in room 106. The Right Honourable Kim Campbell has served Canada as Prime Minister, Minister of Justice, Attorney General and Minister of Defence. She is the first woman to lead a government in North America and is a global thought leader of the highest order. This session will feature a lively dialogue with Jonathan Granoff and Audrey Kitagawa, Chair of the Parliament’s United Nations Task Force and President of the Light of Awareness Spiritual Family, followed by responses from retired Lieutenant-General Romeo Dallaire and Senator Douglas Roche. This session on Tuesday, Nov. 6 at 4:15 p.m. in room 106 will delve into what wise leadership, values, vision and politics look like on the personal, national and global level. The Parliament of the World’s Religions was created to cultivate harmony among the world’s religious and spiritual communities and foster their engagement with the world and its guiding institutions to achieve a just, peaceful and sustainable world. 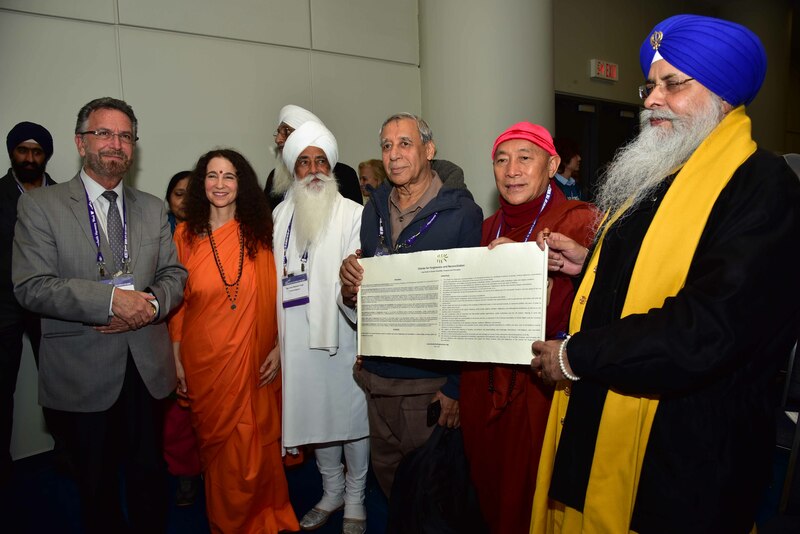 The 2018 Parliament of the World’s Religions is being hosted by the city of Toronto from November 1 – 7, 2018 at The Metro Toronto Convention Centre (MTCC). 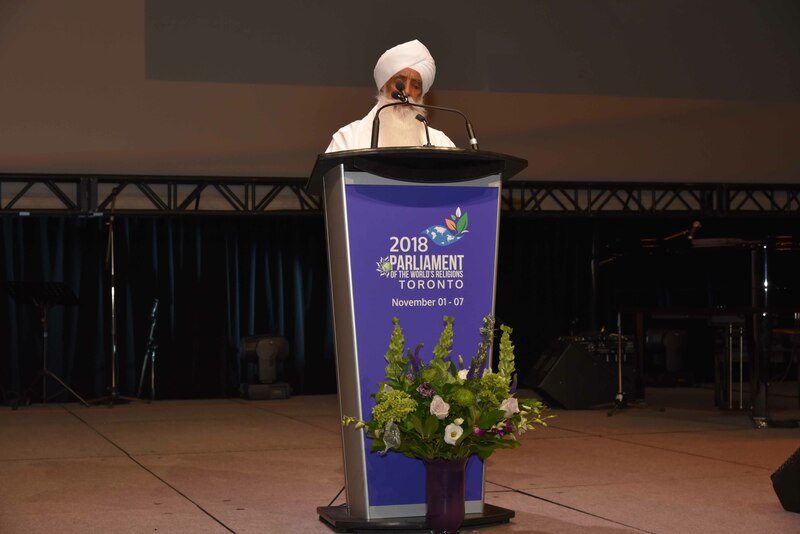 In its distinction as the world’s most diverse city, Toronto will showcase its unique values, achievements, and aspirations as the 7th host of the Parliament of the World’s Religions. A delegation from Takhat Sri Harmandir Ji, Patna Sahib met with the Honourable Prime Minister of India, Narendra Modi today at Parliament House, to invite him to attend the 350th Prakash Purb of Guru Gobind Singh Ji at the Takhat Sahib, during the first week of January 2017. The Prime Minister gladly accepted the invite to attend. The Prime Minister mentioned that the Central Government would look to work with the Bihar State Government regarding long term development plans beneficial to Patna City residents. Makkar; General Secretary of the Takhat Prabhandak Committee, Sarjinder Singh; Chairman of the Takhat Celebration Committee, Gurinder Pal Singh; Bhai Sahib Bhai Mohinder Singh Ahluwalia, Religious Leader of Guru Nanak Nishkam Sewak Jatha (GNNSJ); and Inderjit Singh, Projects Director of GNNSJ India, the charitable organisation responsible for the major beautification, restoration and conservation work taking place to prepare the Takaht for the sacred celebrations. Muslim, Jewish, Christian and European Religious Leaders of all traditions stand united in grief and anger about the terrible attacks in Paris. The Secretary-General of ECRL, the Zoroastrian Jehangir Sarosh, urged all faith communities to “reinforce our resolve to stand in solidarity to strengthen our work for liberty, equality and fraternity”. the last weeks we have seen many atrocities carried out in Lebanon, Syria, India – the list is endless. It is not about the number of lives lost – one life lost is one too many. We need more faith in Solidarity. People of all faiths and none – good human beings need to come together and unite. People of faith are the conscience of the world – we have a duty to speak up and a duty to rally around during times of crisis. The European Council of Religious Leaders – Religions for Peace (ECRL) brings together senior religious leaders from Europe’s historical religions: Judaism, Christianity and Islam together with Buddhists, Hindus, Sikhs and Zoroastrians. ECRL has participatory status with the Council of Europe. ECRL is one of five regional Interreligious Councils with the Religions for Peace network. Religions for Peace – accredited to the United Nations – is the world’s largest and most representative multi-religious coalition advancing common action for peace since 1970. Bhai Sahib Dr. Mohinder Singh, Chairman of the Nishkam group of charitable organisations based in Birmingham has been appointed Officer of British Empire (OBE) in recognition of his unstinting and inexorable work over forty years to promote peace and coexistence by bringing people of different faiths together to contribute to the common good of humanity. Dr Mohinder Singh is the first British Sikh to receive the official title of “Bhai Sahib” from the highest religious Ministers (Jathedars) of the Sikhs’ spiritual and temporal seats of authority in India. Bhai Sahib means ‘a brotherly leader or one worthy of respect amongst the larger family of Sikhs’. Bhai Sahib is a selfless religious visionary leader propagating peace, serving society through spiritual inspiration, infrastructure creation, heritage conservation, interfaith engagement and promoting values-led education. 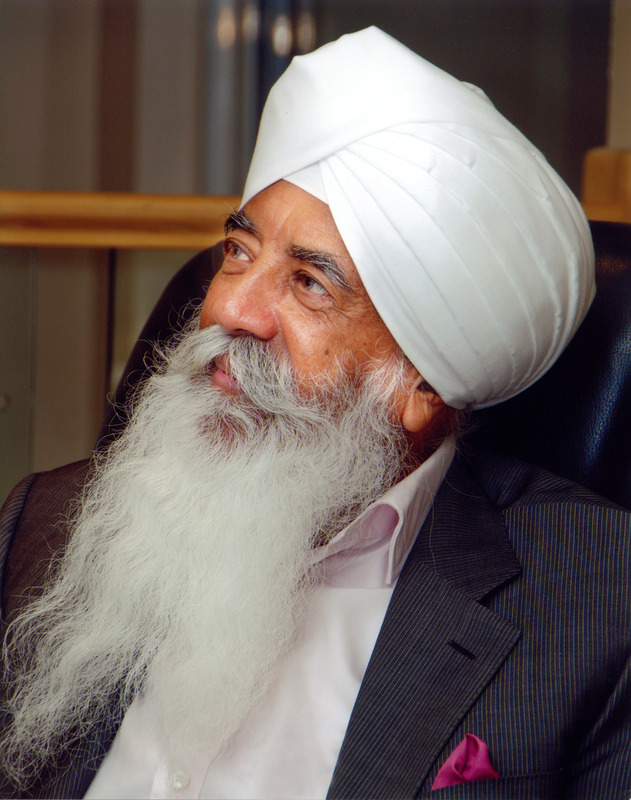 As Chairperson of GNNSJ, one of the UK’s largest Sikh faith registered charities, he is engaged in an astounding range of civic and spiritual initiatives. He is respected as a bridge-builder within communities in the local and global, secular and spiritual, intra and interfaith contexts. 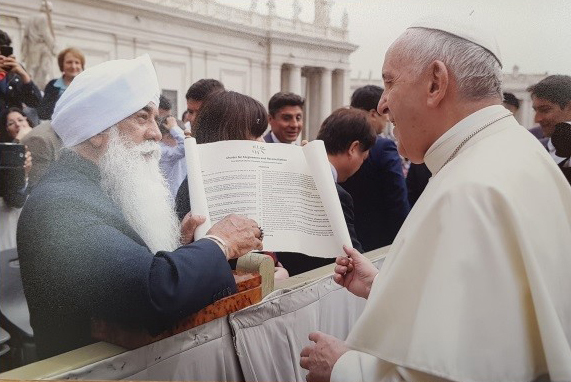 From 1999, Bhai Sahib began to channel his energy into the growing area of global interfaith dialogue and cooperation to pursue the objective of global peace building. He is the founding convener of the proposed international Charter for Forgiveness and Reconciliation, which aims to provide a framework for communities, organisations and Governments to promote forgiveness around the globe. He, along with other prominent international trustees, is actively involved in establishing the unique Museum of World Religions (MWR) in Birmingham, estimated to cost around £60m, to create cohesion amongst people of different faiths and none. The MWR will bring together youth and adults from different faiths to promote mutual respect and peace building. In 2013, His Holiness Pope Benedict XVI bestowed a Papal Knighthood of ‘Saint Gregory the Great’ upon Bhai Sahib for his interfaith work in the UK and around the world. Bhai Sahib chairs the Boards of the Nishkam Gurudwara, established in 1977; Nishkam Community Cooperative (MSS Manufacturers Ltd) established in 1980; Nishkam Civic Association (NCA), a Centre for personal, community and sustainable development that is open to all communities established in 2006; and the Nishkam Healthcare Centre established in 2012 that provides a range of health care services and advice to hard to reach groups. He has been awarded Honorary Doctorates from Birmingham City University in 2002, the University of Birmingham in 2006 and the University of Aston in 2014 for services to religious faith propagation, community service, education and research. Bhai Sahib embraces the concepts of values driven education on one hand and interfaith cooperation on the other as tools to forge lasting and sustainable peace. Propelling this forward is the Sikh Gurus’ teaching to consider humanity as one family with the same light of the Creator in all. He is an international trustee of Religions for Peace International (RPI), which works in some 90 countries. He is also one of RPI’s 50 Co-presidents around the world. He is a senior member of the Elijah Board of World Religious Leaders and a Senior Ambassador of the Globalisation for the Common Good Initiative, which in 2014 bestowed upon him the annual award for embracing the concept of education for the common good by building schools and colleges essential for a sustainable world. In 2014, he was also awarded the highly coveted Guru Nanak Interfaith Peace prize by Hofstra University, New York. Bhai Sahib is Patron of the Nishkam School Trust that has successfully established Nishkam nurseries, primary and secondary schools with a multi-faith ethos in Birmingham, Wolverhampton and London. Nishkam High School and Sixth Form in Newtown was judged as ‘Outstanding’ by OFSTED in its very first inspection in 2014. His greatest legacies will be the transformation of many lives across faiths; the restoration and conservation of the sacred historical Sikh shrines, including Darbar Sahib (Golden Temple) in India; construction and management of outstanding quality Sikh places of worship – Gurudwaras – in England, India, Kenya and Zambia; and the ingenious conservation of listed buildings on Soho Road in Birmingham that now house the Nishkam Nursery, Nishkam Primary School and the Nishkam Healthcare Centre. 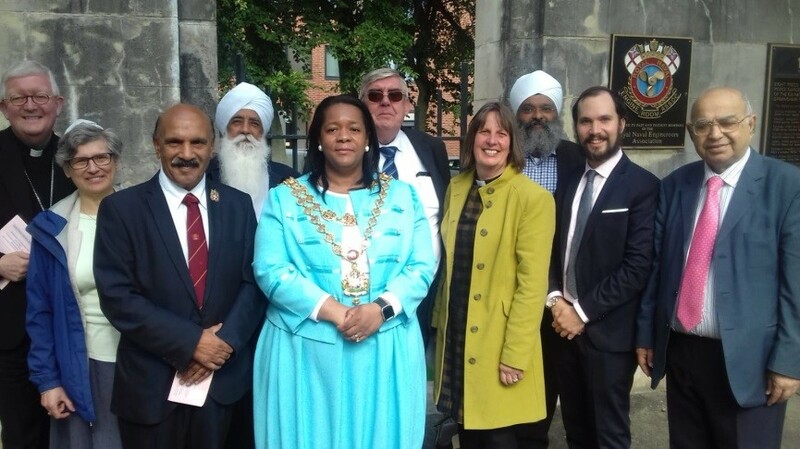 Under his leadership over the span of some twenty-five years, the Nishkam Group has become a major player in the social and economic development of Handsworth in the city of Birmingham, UK and a number of other cities internationally, investing over £50m. He believes in the policy of “service delayed is a service denied” which demands great speed to complete whatever he undertakes to do. As a highly respected spiritual and community leader, he propagates the deeper Sikh sacred teachings that demand the practice of values in everyday life such as humility, compassion, selflessness and courage. As a role model, he generates in others a tremendous capacity for undertaking selfless voluntary service to improve the wellbeing of all communities. debate took place yesterday in House of Lords on the role of faith communities in the UK. Initiated by the Chief Rabbi Lord Sacks, many different aspects of the role of faith communities in British society was debated, including the significance of A Year of Service. “As well as providing spiritual succour to their followers, religions inspire great numbers of people to offer service to their own communities and more widely. A number of contributions made that clear today. Tens of thousands of faith-based charities and community groups work tirelessly either in international development such as Islamic Relief or Christian Aid, or in providing homeless shelters, support for young mothers or care for the elderly in their local neighbourhoods. Care of the elderly in local neighbourhoods is part of the support given by faith groups, and annual projects such as the Hindu-led Sewa Day and the Jewish-led Mitzvah Day motivate thousands to perform acts of selfless service. Sikh gurdwaras not only provide free food to all, but run community centres such as the Nishkam Centre in Birmingham, which I visited. Black-majority churches offer free health advice and counselling as well as religious support.